With a couple of days off, I spent part of them looking at other photographer’s web sites. Several of them talk about both the art of photography and the technology, which I believe is nicely balanced. One topic that I’ve seen several times is the idea of owning or carrying a “backup camera.” This idea is almost universal and refers to using one camera exclusively while on a shoot, while carrying a second, lesser camera body in your bag in case your “good” camera dies. I’m all about redundancy, but I work the “backup camera” differently. For me, the backup camera is a third camera, and it’s sometimes in the cabinet at the office, and sometimes with me. 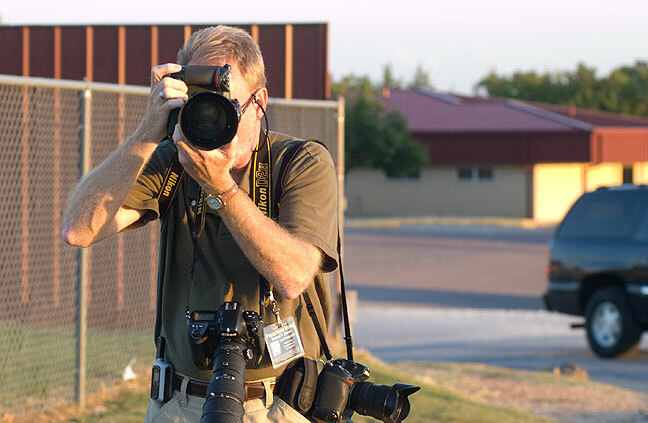 The reason is that in my professional photography, I routinely shoot with at least two cameras, one with a telephoto zoom and one with something wide. No lens changes are ever necessary – I just grab the other camera. When you see me working, most of the time it will look like this: several cameras with several lenses, used with seamless interchange to allow me to capture the immediacy and intimacy of the moment. In this scenario, I usually prefer my cameras to be equals with the same capability. Not only does that keep me from preferring one over the other, it means that if one of them craps out on me, the second camera will still give me the results I need. Having a backup camera, for me, then, means having three identical cameras. The backup camera is locked in the cabinet in my office, and gets rotated into my hands every few days so they all get about the same amount of use. I can hear the photo.netters now, saying they can’t afford three $5000 cameras, and in my mind that means they can’t afford to be real photographers. As I have said before, most “photographers” don’t need any $5000 cameras – they need to wear out three $500 cameras. Add to that the fact that I believe that using older, less capable gear can make us better photographers by forcing us to use our wits and creativity instead of blasting away at 11 frames per second or cranking the ISO to 102,400. United States Navy Strike Fighter Tactics Instructor program is a great example of this. Top Gun students get state of the art carried-based fighter jets like the F/A-18 Super Hornet, and instructors customarily fly smaller, simpler aircraft, and virtually always defeated their students in combat scenarios. Why? Because airplanes don’t win battles, pilots do. The exact same thing applies to photography; cameras don’t make great photographs, photographers do. Bottom line: If you really can’t afford two identical or at least very similar cameras for use in most basic shooting scenarios, it might be a smart play to take a step back from photography and redefine your priorities: letting go of devotion to the “latest and greatest” technology, and taking hold of using more modest means to make more honest images. For working photographers: +1 to everything you said. For peons like me, a “backup camera” just means “I still own a working camera if my primary one craps out.” 🙂 No income depends on either one, and no one except me will be disappointed if I’m “out on a shoot”.